Startups distributing solar-based energy products to those not adequately served by the conventional electric grid in Sub-Saharan Africa and South Asia have raised $1.3 billion since 2013, largely from family offices and development finance institutions seeking to combine profits with impact. The money has raised hopes that private entrepreneurs and investors can make a dent in expanding access to electricity in developing countries. 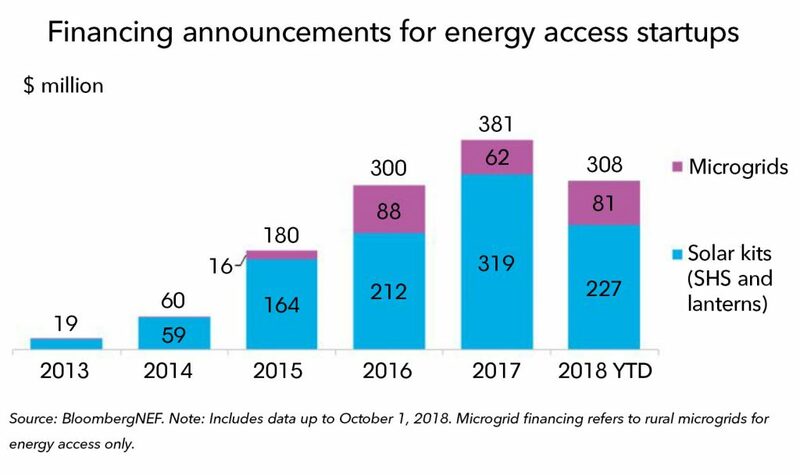 The pace of funding to date is, however, insufficient compared with the $353 billion BloombergNEF estimates would be required to reach universal access to electricity by 2030. Furthermore, investor interest is shifting away from larger Series C and D rounds to scale businesses toward smaller rounds for more novel approaches such as solar-powered cold storage and irrigation instead. BNEF clients can access the full report Microgrids in a Changing Power System on the Terminal or on web.